To say you had "creative opportunities" on your current quilting project, as we all have experienced, is a transformed "Uh, oh" moment. It means "things didn't work out as planned, but I'm trying to be positive". We all know those moments. A "mistake" happens. After having a moment of panic, we take a deep breath and look for the gift in the "mistake": look for the hand of God. The making of Majesty has had its share of creative opportunities. My box of Quilter's Candy for Majesty, both hand and machine. Aren't they delicious? It started when the fabrics began to arrive from Island Batiks for my two new designs: But the ones for Majesty didn't. I contacted Island Batik. There had been a mix up. So, the fabrics would arrive late. Then I found out that they didn't have enough of the top fabric I had selected for the hand version of Majesty. So, they selected something in a similar color family and pattern. For me, getting a box of fabric is exciting, even when I'm not sure what's in it. 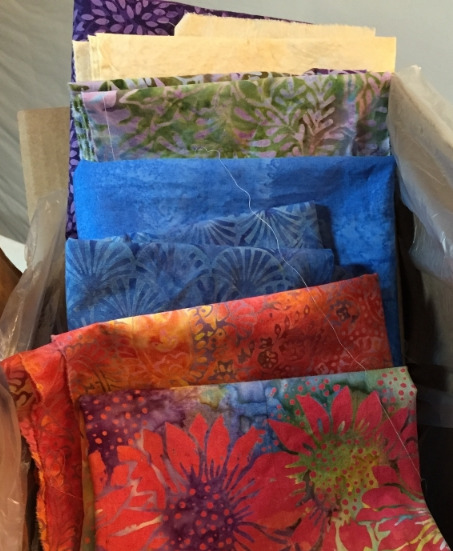 It is like getting a box of candy, quilter's style. I can see it and feel it, and it stirs my excitement. Island Batik chose very well on my behalf. I did have to take a moment to re-adjust my initial envisioning for my hand Majesty medallion IX. These fabrics had a soft, delicate feel-a quiet majesty, where as my original fabrics made a bold majestic statement. My machine fabrics are bold and vibrant. In truth, I received all of my fabric combinations with hopeful anticipation. When you pick fabrics from digital images, as I had to do, there's always a question about whether it will really work, since computers just don't show the true value and hue of fabrics. When my fabrics actually arrived, I had more doubts about the combination I chose for the machine version, but that's a different blog. Fabrics for Hand version of Majesty. soft and delicate-a quiet majesty. After I petted my fabric and drooled over it for awhile, I put it in the washer to pre-wash it. The washer quit working before the final spin cycle on the second load. On our front loading washer that meant the door was locked, so my fabric was a prisoner of the washing machine. I pulled out the manual and followed their steps for the flashing "F11" crisis. The washer wouldn't open. So, I prayed, said "Oh,well", and went to bed. In the morning I told my husband of the washer's escapades. He followed the same emergency procedures I did the night before, and guess what? It opened. Thank God for his magic touch. I dried and ironed my fabric to make it ready for the pattern.